The most common material for the deck of the skateboard is plywood. However the better a skateboarder you become the better a deck you can get. Beginners start off using plywood but often move on to a more advanced material like aluminium, fibreglass or another form of artificial material.They use such materials because they need to be strong, thick and to an extent flexible. 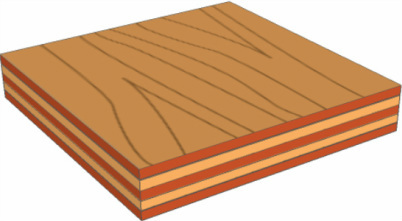 Plywood the material mainly used is shown below. The main material used for trucks is Aluminum, this is for the more high quality skateboards only steel is used the lower class skateboards. 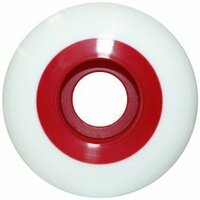 They use this because it is light and grinds well however it isn't a very strong material. Steel is stronger and therfore would be longer lasting but it is very heavy and would weigh the skateboard down. Some people prefer to use titanium instead of steel or aluminium because it does something that both other materials do. The riser is made from plastic and is used to stop wheel bite (wheels hitting the bottom of the board when turning). 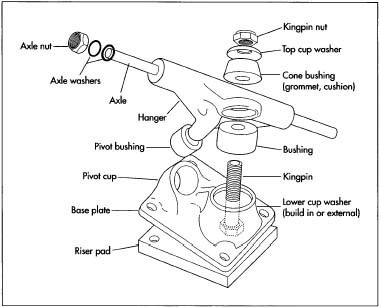 The axle of the skateboard is fixed in place unlike a car. This is to protect the axle nuts from unsrewing and allowing wheels to fall off.